According to the Annual Topline U.S. CPG Coupon Facts Report for Year-end 2010, released by NCH Marketing Services, Inc., marketers distributed 332 billion coupons for consumer packaged goods last year, marking the largest singleyear distribution of coupons ever recorded in the United States. Those coupons redeemed totalled $3.7 billion in savings for consumers. Fueled by frugal recession-weary shoppers, coupon usage has climbed from 63.6% in 2007 to 78.3% in 2010, according to NCH. Most of those coupons distributed — a full 90% — came in the form of free-standing inserts, according to Inmar, the company that handles the bulk of coupon processing in the U.S. But retail marketers take note — that’s not where the leading growth in redeemed coupons lies. Checkout coupon redemption rates grew 39% in 2010, faster than freestanding insert coupons, digital promotions, shelf-pad, and in-ad coupon offers. Indeed, coupons printed on receipts enjoy a redemption rate that’s three times higher than that of direct mail and newspaper circular-based receipts. Bob Carter, president of promotion services for Inmar, says the data his company is gathering tells us that consumers are still looking for deals, but appear to be less motivated to seek out and redeem out-of-store offers. The ability to leverage receipts to communicate brand awareness, promotions, coupon offers, and other forms of customer engagement is not new. Consumers’ enthusiastic return to interest in that messaging certainly is. The consumers who are most enthusiastic about coupon redemption might surprise you as well. Assumption might lead you to believe that the lowest income households are the heaviest coupon users, when in fact it’s your best customers who seek them out and cash them in. Coupon usage in 2010 was dominated by households with incomes greater than $70,000, with 38% of what Inmar labels “super heavy” users and 41% of “enthusiasts” coming from that demographic. Households with income of more than $100,000 drove coupon growth in 2009. Finally, lest you think the coupon craze has come and gone, the latest ﬁgures show coupon redemption was up 4% in the second quarter of 2011 compared with the same period in 2010. As in-store couponing goes, nothing beats the receipt. Modern, powerful software tools allow endless and easy customization of designs and parameters on receipts, such as targeted offers to customers who meet speciﬁ c purchase thresholds. Chain-store retailers can even create store-speciﬁ c messaging and offers, enabling location based messaging that’s custom-ﬁ t for the demographics of their consumers. The writing is on the wall — if you’re not promoting special offers on your register tape, you’re missing a powerful opportunity to delight customers and drive repeat trafﬁc. 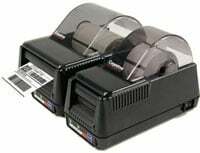 CognitiveTPG today announced the availability of its newest member of the desktop label printer line – the DLXi. 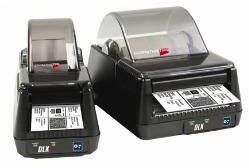 The DLXi combines the legendary reliability of the Advantage LX and Blaster printer lines with the latest communication interfaces and performance. The DLXi is designed to operate in challenging environments while providing a seamless migration to the latest technology. The DLXi carries on the tradition of metal frame construction and a metal print mechanism for the utmost in reliability backed with a 2-year warranty. However, it is the communication connector combinations that set this unit apart. The 4-inch print width model offers the most communication interfaces offered on a desktop printer platform (Serial, Parallel, Ethernet, USB-B and USB-A host). J & D Pharmacy has been in business for more than 30 years. As an independently owned pharmacy, J & D Pharmacy owner Don Grove understands the pressure to provide superior customer service, added value and combat increasing competition. Fortunately Mr. Grove is a technology adopter, not afraid to try anything that will improve business and customer satisfaction overall. When J & D Pharmacy set out to replace its Pharmacy Management software they were also looking for ways to improve workflow in the pharmacy operation. J & D Pharmacy chose Computer-Rx because it was the most user friendly Windows-based software system and because they offered excellent support. This level of support went beyond technical support. Computer-Rx recommended that J & D Pharmacy replace its Lexmark laser printers with the CognitiveTPG CRx printer for printing the prescription labels. It was not difficult to convince Mr. Grove that the CRx thermal label printer was the best solution for his operation. “When you are printing over 10,000 prescription labels a month it is important to optimize the workflow to save time. We saw the CRx printer as a perfect fit for a stand alone solution in our pharmacy operation,” said Jennifer Jelinek, Director of Pharmacy Operations at J & D Pharmacy. While workflow is important, the driving force behind making this technology upgrade was the cost savings both in terms of the cost of the barcode labels and the cost from the downtime. “We found that the printers paid for themselves within a month and the technicians were spending more time filling prescriptions than fixing a laser printer jam,” said Don Grove, J & D Pharmacy owner. Copper Mountain Resort needed a system to effectively manage its rental equipment inventory between five store locations and to expedite the rental process for its skiers and boarders. Copper Mountain Resort was using an inefficient system to track and manage its inventory of ski rental equipment between each of the five different rental locations. According to Gary Deetz, Warehouse Supervisor, the self made system was faulty and labor intensive. Basically they combined 3 pieces of construction paper to determine store location, shelf location, and product information – the color paper represented the store location. They needed a system to effectively manage its rental equipment inventory between five stores and to expedite the rental process for its customers. The system had to operate as a stand alone because of limited workspace to include a computer. They also needed to print serialized labels and be able to easily enter the variable information on the spot for the replacement labels. Finally they needed a label that would adhere to the ski, pole, boot, or snowboard without falling off due to the wide array of environments from freezing cold to 70 degrees and very wet conditions. CognitiveTPG worked directly with Gary Deetz and his team to find a customized labeling solution to meet the ski resort rental facilities’ requirements. The C Series printer (4” Cxi) was the printer of choice because of its durable construction, LCD user interface menu, and its ability to attach a keyboard/scanner peripheral for a stand alone solution.